– Staging Area: Turn your approach into a staging area. 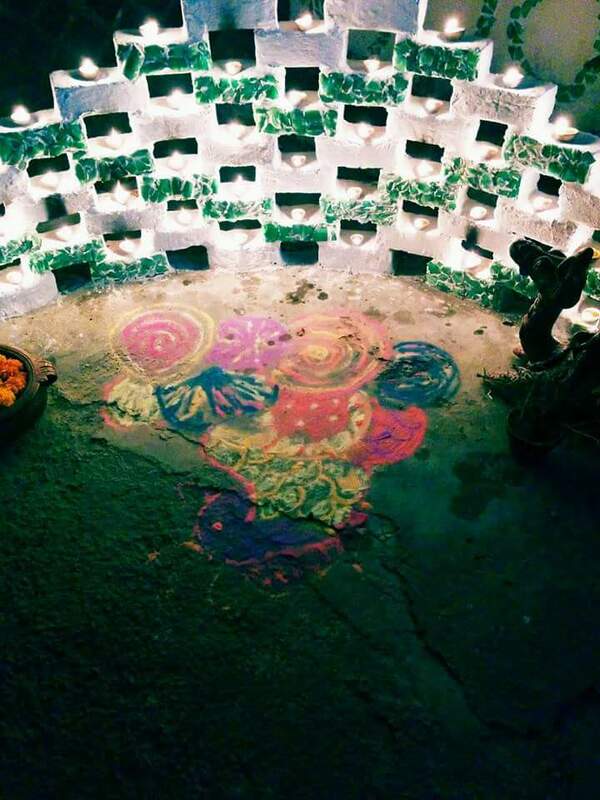 Layer with bricks and put a neon spray painted screen nearby. Let the diyas do the rest of the talking. – Entertainment Central: Keep your main seating comfortable and low. While the guests may be formal when they first walk in, a few rounds of drinks and card games later, they will be ready to relax a little more. Put plenty of floor cushions out and deck your coffee table with zig zags of ethnic printed runners. – Go Heavy metal: This is the best time time to use your steel, brass and silver ware. Bring out this finery and play with colourful sweets and flowers to create an ambience. Plus, place these at various points so that your guests can help themselves and the conversation can flow more freely, instead of the host butting in to serve groups of people. – Fire and Water: Ensure that you play with fire and water – only, be safe. Get pretty and flat containers out and fill with water, petals and candles for some cool ambience. Use stoneware as well – this material is the new earthy rage! – Be Prepared: Glasses and serve ware should be wiped and laid out well in advance so that you do not abandon your guests in uncomfortable silence!